Mexican composer Arturo Fuentes presents now, on Kairos, an astonishing collaboration with the internationally acclaimed Quatuor Diotima. Hailed as the 'rising star' of Mexican music, Fuentes, now living in Austria with his music performed across Europe, introduces to us here some of his most refined music, creating a colourful and imaginative world. Glass Distortion it’s certainly a step forward into the new music composed for string quartet. Leichtigkeit ist eines der Schlagworte für Arturo Fuentes’ (*1975) kompositorische Zugriffsweise sowie das klangliche Resultat, ebenso ein ‚bestimmter Dynamismus‘, eine Offenheit gegenüber unterschiedlichsten Anregungen, die es braucht, um diese eigenwillig schwingende Musik zu schaffen: fein ziselierte Geräuschklänge in stetem Fluss. Der bereits gewaltige Werkkatalog des mexikanischen Komponisten listet spartenübergreifende Arbeiten in verschiedenen Besetzungskombinationen, auf diversen Ebenen tritt die Musik in den Dialog mit Elektronik, Filmkunst, Literatur und Philosophie. All of these pieces are indeed sonorous. And to my ears beautiful. 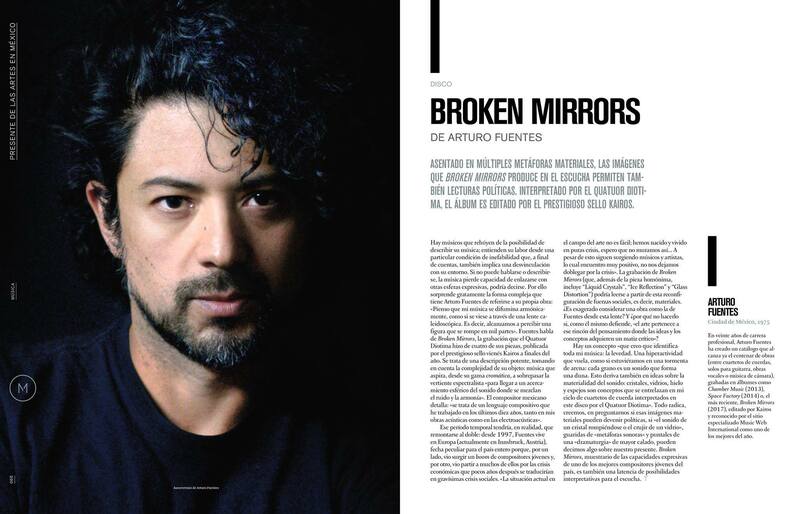 As I understand the notes accompanying this Kairos issue, Fuentes’s goal in these four works is to attempt the transliteration of the kinetic energy latent within objects, substances and physical states into musical form. This is incredibly busy, astonishingly detailed music: the words ‘light’; ‘particles’ and ‘kaleidoscopic’ occur and re-occur in the notes, and give a good indication of what this music is like. I feel it would be wrong to simply categorise this music as ‘spectralist’- Fuentes is after all microscopically subjecting phenomena to analysis that goes far beyond the properties of sound. The products of these experiments are both formally convincing and sonically appealing. I earnestly hope this review will prick the curiosity of readers not normally attracted by challenging contemporary composition – this music is far from forbidding and is frequently profoundly beautiful. I believe their sense of adventure will be amply rewarded.